MAXX Factor, a Baltimore based quartet singing in the barbershop style was formed in 2005. 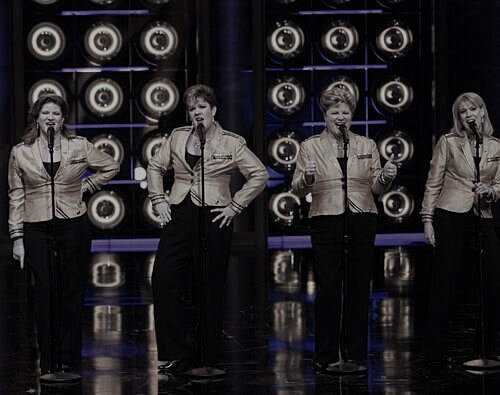 Tenor Molly Dalton Plummer, Lead Leslie Shoenhard, Bass Valerie Hadfield-Rasnake and returning original Baritone Kim Gray, are the 2011 Sweet Adelines International Quartet Champions. In 2009 MAXX became the Mid-Atlantic Harmony Sweepstakes and National Harmony Sweepstakes Champions as well as being selected as contestants on the very first season of NBC’s "The Sing-Off." Over the past ten years, MAXX Factor has been competing, performing and teaching barbershop style singing across the United States and internationally. They have performed the National Anthem at sporting events for NASCAR, the Baltimore Ravens Purple Evening, the Aberdeen Ironbirds, the Philadelphia Phillies, the Baltimore Orioles, as well as for several charity events throughout the State of Maryland including the Maryland Half Mile Marathon. MAXX performed as Special guest performers on the "The Sing-Off Live Tour," The US/Japan Goodwill concert at Carnegie Hall and at the Harmony on the Harbor Concert at The Joseph Meyerhoff Symphony Hall in Baltimore. They are 11 year National Anthem performers for the Baltimore Orioles as well as performing yearly at The Coronet Club Show at the Sweet Adelines International Convention. For more upcoming performances see the events page at www.maxxfactorquartet.com. Contact MAXX at maxxfactorquartet@yahoo.com to schedule a performance or coaching and "friend" the group page on facebook at "Friends of MAXX Factor Quartet" and "Like" us on Facebook at maxxfactorquartet.com.